All that great news about the Emmy nominations reminded me... there are other awards out there that you don't need to be a member of the Academy of Television Arts & Sciences to vote on. Even if you haven't finished doing all your Hugo reading (I haven't myself), you should still vote now, lest you forget. Don't worry, you can change your vote as many times as you like between now and the voting deadline, if further reading gives you a new favorite. I do urge all worldcon members to vote, and to vote "No Award" only if they feel that none of the works in the category are worthy of a Hugo. (Sadly, there are several categories where that is true, IMNSHO). Many of the slated nominees this year are hostages, and to punish those works and their authors by placing them below No Award seems very wrong to me. The nominations for the Dragons close on July 25, so their deadline is even closer than the Hugo deadline. 'twould be nice if the culture war that has troubled the Hugos the past few years would leave this new award alone... but, alas, I fear that will not be the case. There's already plenty of campaigning in evidence on the internet. Since the Dragons are brand new, that may or may not matter. Dragoncon itself is a huge beast, and if the turnout for their awards is large enough, any effort at slating or logrolling could be swamped. Depends on how many fans vote, I guess. I've said since the very start of the Puppy Wars that it would be nice if the field had a true People's Choice Award to stand as a complement to the older and more established Hugos. So I applaud Dragoncon's effort, and will be interested in how this all turns out. Whether this dragon will fly high, or flap around for a few years and vanish like the Gandalfs and the Balrogs... I guess that all depends. (I hope the Dragoncon people come up with a cool trophy. I am fond of dragons, as is well known. And two legs, please, not four). As I expect you know, I'm still engaged trying to support techincal fixes for the Hugo nominations process. Your readers may be interested in the conversation here or my fundraiser to attend the Hugos here (only $450 to go out of $1400). If you're tired of thinking and writing about this side of the issue, I understand. But if not, a post from you is always a worthwhile addition to the conversation. Sorry to hijack this comment section. I wanted to thank you and your minions for taking the time to allow us non-US readers to get signed books. 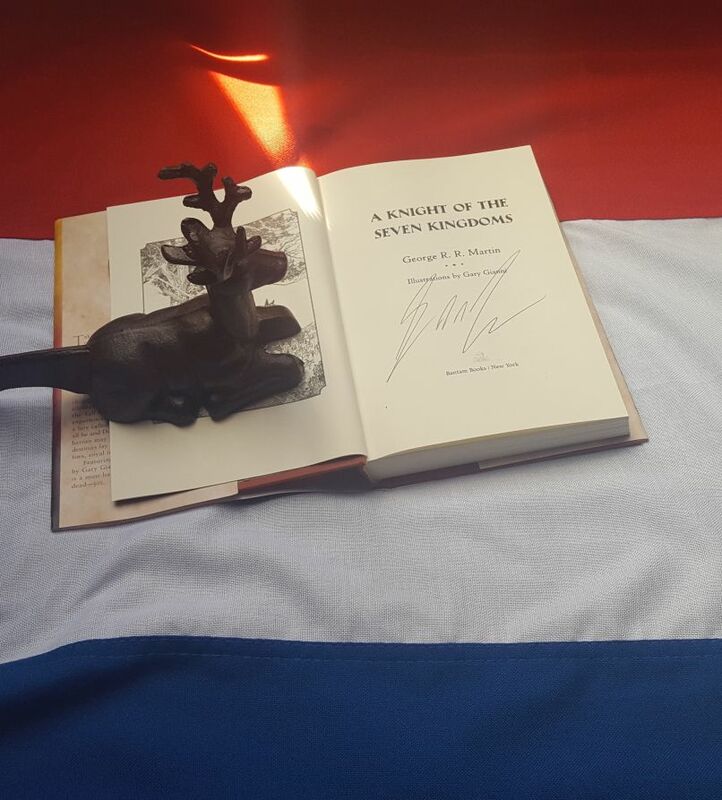 My copy of A Knight of the Seven Kingdoms has arrived in the Netherlands and I couldn't be happier. Thanks again. But I thought, at least according to past blog posts of your's, that the Hugos ARE the People's choice awards, and that is what makes them so special. These analogies are never precise, of course... but no, the Hugo Awards are more akin to the Oscars. They are each the oldest and most prestigious awards in their respective fields. To vote for the Oscars you must be a member of the Academy of Motion Picture Arts and Sciences; to vote for the Hugos you must be a member of the World Science Fiction Convention. In the Dragons, as with the People's Choice, anyone can vote. As for the Nebulas, they are the SF equivalent of the various guild awards: the WGA award, DGA award, SAG awards, etc. Why 4? I understand that it's a bit more realistic, but is there not more leeway in the fantasy genre? Or is it just your personal preference? Two, not four. Four looks absurd. The front legs should be the wings, as in bats and pterosaurs. If anyone is interested in reading (or better yet participating in) a discussion of the Hugo finalists, we have numerous discussion threads for every category, both Retro and non at the Hugo Recommendation blog (https://hugorecommend.wordpress.com/2016-schedule/). This upcoming week, we will be working through the 1941 and 2016 novel finalists, but it's never too late to chime in on any of the categories or just read what other fans have to say. I'd like some day to see you in France to have my books signed, you are my favorite author. ASOIAF is my favorite series. I also love the tales of Dunk and Egg. Can't wait for the books to come. So thank you for all those great stories ! Have the various publishers and writers of the world finally managed to get the nomination situation with the Hugo's sorted out? If not for ASOIAF, It wouldn't have been possible to watch Game of Thrones which enticed me to read ASOIAF, creating a feeling of emptiness needing to be filled after completing the series for the second time. That void lured me into trying other fantasy novels which has paved the way to Four Corners of Civilization and The KingKiller Chronicles. Hopefully this comment is considered on topic since Fantasy/Sci-fi leads to Cons and Awards right? Is the Jean Cocteau really having a 19 author event next Sunday, I mean, that's amazing but. . .where are they all going to sit?! If you are nominating for the Dragon Awards, be careful about the eligibility period. It's 7/1/2015 to 6/30/2016, NOT 1/1/15-12/31/15. So works from the first half of last year are ineligible, and works from the first half of this year ARE eligible, but won't be next year. And according to the FAQ, you only get ONE nomination per category, and you can't change it once you've made it, although you can go back to your ballot later and nominate in a category you'd previously left blank. Congrats again with all of your success with Game of Thrones! Do you have any options for merchandise licensing? I have some fan art that I would like to reproduce and sell. You can do all the fan art you like for your own personal pleasure... but selling it is another matter. Any commercial usage of GAME OF THRONES images would require the permission of HBO. What about dragons with four legs and no wings?